A few years ago, I was lucky enough to work with JJ Heath-Caldwell on the fascinating journals of Lieutenant Charles Crowe of the Inniskillings. However, JJ is also priviledged to also be in possession of the diary of Charles’ brother Philip, who served in India with the 2nd Regiment of Bengal Native Cavalry, a regiment raised by the Honourable East India Company to protect and police their possessions. Each of the three presidencies of India, Bombay, Bengal and Madras each formed and maintained their own armies at this time. 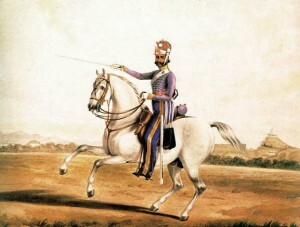 The 2nd Regiment of Bengal Native Cavalry was originally raised in 1788 from Afghans of Kandhari origin who has settled in Lucknow by the Nawab of Oudh. 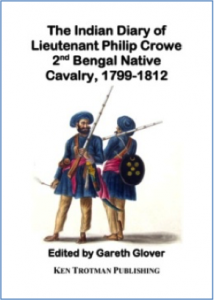 It was renumbered as the 2nd Bengal Native Cavalry in 1796 when it was taken into the East India Company’s Bengal Army and was ordered to consist of 24 British officers and 400 Indian men. 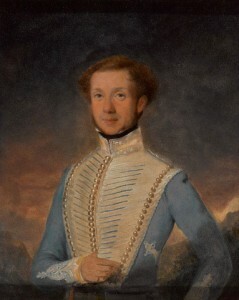 Philip Crowe of Hartley House, Coulsdon, Surrey was born in 1779 the oldest child of Philip Crowe of Swaffham and Margaret Crowe. He became a cadet in 1798 and sailed to join his regiment in 1799 and served in India until December 1811. He was appointed a cornet on 10 June 1800 in 1st Bengal Native Cavalry but transferred to the 2nd Regiment in May 1801 and became a lieutenant on 11 March 1805, but we know he returned home around late 1811 and that he was in England with his brother Charles in September 1812. He finally resigned his commission (whilst in England) on 22 May 1815. In September 1803 when serving with General Lake’s Army at the Battle of Delhi, he was severely wounded and it became necessary to amputate his foot. He then continued to serve by carrying out desk duties. His diary is actually more of a biographical almanac of the officers he served with in India. He is very candid regarding their relationships and peccadilloes and I am sure that this was produced in England solely for the private enjoyment of his immediate family! It is therefore very interesting regarding both these individual officers and it also reveals much about the social and military life within the Bengal presidency of the early 1800’s. It is accompanied by a great number of original drawings made by Philip Crowe whilst in India which accurately depict the various peoples he encountered. These drawings are very accomplished and detailed and add great value to the diary on a social level. It has been an fascinating and educational sojourn from my normal source material, but it serves to highlight the large numbers of troops which served during the Napoleonic wars in India, a largely forgotten but hugely important and influential theatre of war. It is high time that it gains its rightful place within the story of the original ‘Great War’.